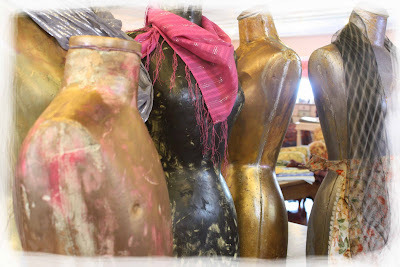 These older mannequins have been in our offices for years doing duty in the showroom and for photography shoots. A few weeks ago, I walked by them on one of our work tables, and decided they needed "something." I took them home and have been painting them to make them look even older, and in the process they have become beautiful - ancient in fact. Like the broken bodies of ancient Greece: one ebony, one gold, and one silver. Their new patina is a lovely symbolism of the beautiful depth and layers a woman develops through years of experience and wisdom. A reminder that there is deep beauty in age. These gals have a whole new modeling career ahead of them, so watch our site. Looking forward to their new looks. Although they are beautiful as they are.